Notes: To coincide with the launch date of the film 'Star Wars The Force Awakens' on 17th December, Royal Mail issues a Prestige stamp book which contains all 18 stamps from the original 20th October issue. The above cover was originally issued on 20th October when the first Royal Mail Star Wars stamps were released. As I had a few covers remaining from the original 20th October stamp issue, I decided to add another Star Wars stamp to each of these covers and then have Royal Mail apply this additional one-day EMPIRE WAY postmark in use on the 17th December. Obviously I only have a few of these, now rare, double-postmarked covers. Available in the starwars2 offer. 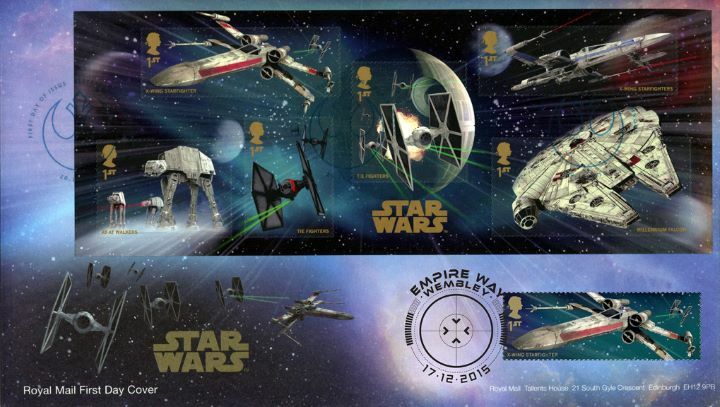 The above Royal Mail PSB: Star Wars stamps were issued on 17 December 2015 by Royal Mail and feature the following stamp designs: . The Double-dated Star Wars Cover 2 first day cover with the Wembley, EMPIRE WAY, Special Handstamp postmark has been produced by Royal Mail/Post Office and features these stamps which can make a very collectible and lovely gift.